Following on from the first workshop, Jenny conducted her advanced workshop to a further 15 keen participants at West Winds Community Centre at Woodbridge from 20-24 February 2017. Participants were taken on a journey using observation and various watercolour techniques to achieve paintings of fruits in season such as blackberries, rosehips, plums and watermelon. 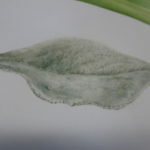 An interesting diversion was the painting of a Stachys byzantina leaf – also known as Lamb’s ears – to achieve the light, soft felt texture. 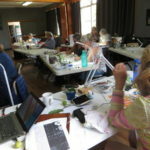 Participants over the two weeks are extremely grateful to Jenny, one of Australia’s most influential botanical artists, for making time in her busy schedule to come to Woodbridge and conduct the workshops. Our appreciation is also extended to Annick Ansselin, the Channel Regional Arts Group and West Winds Community Centre for bringing us this event.